I take great pride in my work. 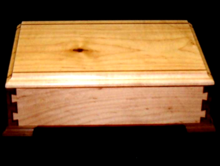 All of the products I offer are made by me using domestic and or exotic hardwoods. I will ship items to you the cheapest way possible unless you want something different. Here are some examples of my work. If you want to purchase any of my items or have any questions regarding my products, or want something made from a specific type of wood or would like more information, please contact me with the request info tab. This shows a close up of the double dovetail corner post and the hand made hinge. Note: Most of the puzzle boxes are made from western red cedar, and all open with the lock and slide principal, see video. pictures of things from the lathe are representations of items, if interested inquire about the item or ask to have one made to your specifications. Prices on request. Stash key rings,hide your pills, money, etc.